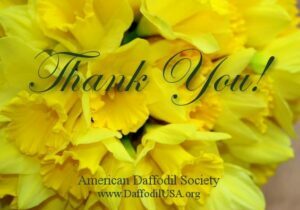 Rathowen Daffodils was begun in 1972 by Tom Bloomer in Ballymena, Northern Ireland. He was a successful exhibitor in Northern Ireland shows, and at the RHS shows in London. In later years, he used most of his own seedlings, and in 1972 offered them in his first catalog. In 1974, Brian Duncan and Clarke Campbell acquired the business, and continued until 1988. In 1989 the partnership dissolved, allowing each partner to pursue his own interests. Mr. Duncan continued as Brian Duncan Daffodils, and Mr. Campbell continued doing business as Tyrone Daffodils.